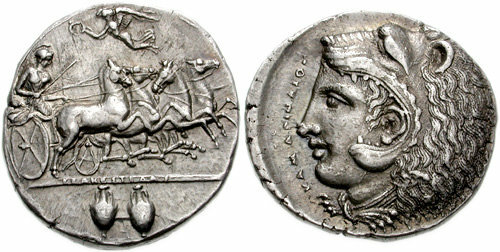 Notes: In an unusual occurance, both somatypes of the demigod Herakles appear contemporaneously on the tetradrachms of Kamarina. There is the visage of the weary warrior, bearded with a brow creased by the cares of the world, and the mouth turned down in a scowl. Contrasting with this is the portrait of Herakles as a young man, beardless and fresh-faced, with an air of dispassionate strength. These portraits follow the two traditions of the myth of Herakles. The first, and most likely the oldest, is the bearded head. Here Herakles is a demi-god, son of Zeus and a mortal woman, and the product of the absorption by the Greeks of earlier traditions from the east, ranging back in time to the Punic divinity Melkart and even further, to Gilgamesh of ancient Babylonia. Exakesidas, on the other hand, taps into a purely Greek concept of the hero as a perfect man, young, strong, and handsome - a koros. The two threads interweave to create a noble protector, enjoying the favor and protection of the gods as well as the strength of his own arms.